A real (often comical) look at life as it happens in the world of Real Estate Associate Broker, Trisha Peters. Read on for the latest news in real estate in Wayne, Nebraska and the surrounding communities as well as useful tips for buying and selling your home. Bonus features include a look into the good, the bad, and the ugly of homeownership as shared by blog author, homeowner, property manager, and real estate broker, Trisha Peters. As we roll into the summer buying and selling season, anxieties are running high. Severe storms have threatened the area, homes need to get sold so others can be purchased, and a new batch of professionals are moving into town seeking quality rental housing that is in short supply. As the area battened down the hatches on Tuesday in anticipation of powerful thunderstorms, two home sellers were biting their nails in other parts of the country as the storms raced towards Wayne. Time moved in slow motion for those sellers. They were waiting for word that the closings on their homes had officially happened before any storm damage occurred. On the flip side, two very nervous buyers were accepting the keys to properties that were now their sole responsibility just hours and minutes before the storm hit. Every other property owner in town was holding his/her breath and hoping the reports of golf ball sized hail were mere exaggerations. Luckily, Wayne was spared the brunt of the damage. Our homes, businesses, and personal property are all intact and we are thankful. Baby steps. I say baby steps because everything we go through in life, whether it's a storm, buying or selling a home or, quite literally, having a baby, needs a little perspective some days. In an age of instant answers, we expect fast and accurate results in everything we do, see, and hear. We expect the weatherman to predict the storm pattern. We expect to be able to move in to a home or move on from it within our planned timeline. And, we expect past results to predict future performance. The thing of it is that sometimes the things that don't go as expected are destined to help us experience something else we would have otherwise missed. Baby steps. Baby steps. Had it not been for the storm, I would have missed my son's first steps. My husband would have missed them, too. And those would have been some big steps to miss. The storm brought my husband and me home quite a bit earlier than usual on Tuesday. We ate supper earlier than usual, and we were glued to the television watching storm coverage at a time of the evening when we are both usually still working on a project. And then it happened...baby steps. Right there between storm coverage and an evening treat of caramel popcorn. Right there between the recliner where dad was sitting and the couch where mom was sitting. Baby steps. The storm that brought grumbles from both of us for bringing unexpected changes to our typically well planned day had also given us this wonderful opportunity. Baby steps. That very important moment in our lives opened my eyes to how and why things happen the way they do. Just like the other events in our lives, home buying and selling is a step by step process that is often carefully planned and calculated just like two tiny feet plodding a three foot distance between living room furniture. Some homes sell quickly, others take months and even years to sell. Often times, there is little or no explanation as to why a perfectly sound home takes so long to sell with the exception that the right buyer has not seen the potential that home holds. And maybe the reason is that the time just isn't right yet for it to happen. Perhaps you might miss out on something else wonderful that would have otherwise been missed if it had sold immediately. The baby steps we take to buy or sell a home are for a reason. We don't always know it at the time, but eventually the reason becomes clear. If you feel like you are taking baby steps at this time, don't be alarmed and don't get too anxious. The spring and summer months are an exceptional time to buy or sell a home, and if you move too quickly, you might just miss out on something wonderful. Welcome Home. As a licensed real estate agent since 2004, I have often been encouraged to share the humorous side of life as an agent, mom, remodeler, and property manager. The majority of my real estate activities involve residential, commercial, acreage and farmland sales in and around Wayne, NE. My husband and I have spent the better part of our married life working on do-it-yourself projects and raising our family. I look forward to sharing my experiences as a real estate broker and a homeowner. 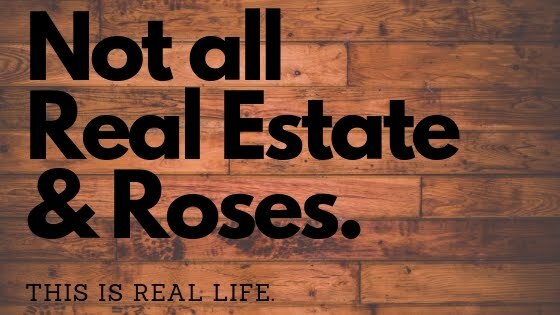 After all, it's not all real estate and roses when it comes to real life. Welcome Home! 2013 Trisha Peters. All Rights Reserved. Travel theme. Theme images by Terraxplorer. Powered by Blogger.